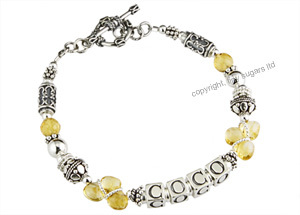 Customize your search of our exclusive mothers bracelets by style or the number of names in your design. freshwater pearls, semi-precious gemstones, 14k gold accents or personalize with Swarovski crystals. of other minerals (as shown in the Garnet). Similar to a fingerprint, no two gemstones are identical and each may vary slightly from the images shown. Personalize our mothers bracelets and select from a variety of precious and semi-precious stones in a variety of sizes, cuts and finishes.